11/23/13: As we first reported on 11/20, this hotel will in fact be going into the Fred Jones Building. Would be an awesome place to convert to apartments. 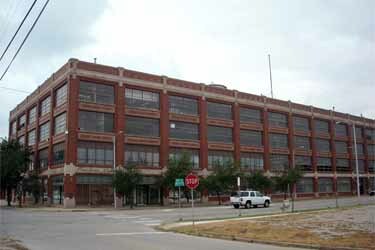 Was an early Model T assembly plant. Mr. Jones worked there as a young man before going into the car business himself. Eventually he and his company became wartime innovators in the automotive remanufacturing industry. Because of materials rationing and conversion of automobile manufacturing plants to military production, you could not buy new automobile models. People still needed to have cars though, so he and his company filled that need by remanufacturing components such as engines and transmissions. Initially they started in the back of the Fred Jones Ford dealership at Robinson and Reno. They became the largest remanufacturer in the U.S., and when he needed to expand, Mr. Jones bought the old Ford plant where he had once worked. It is a great American story. Agree wholeheartedly that it could/should be some of the best loft housing anywhere in this part of the country. Amazing floor-to-ceiling casement windows all around, great proximity to a rapidly-emerging district in Film Row...so much potential. In some ways this building and Film Row reminds me of Brightleaf Square from home. Two old tobacco warehouses converted to retail, restaurants, and office space. Is the building for sale again? When OCU Law was looking at it, one of the family spokesman (fred jones hall) was quoted in a Steve Lackmeyer article (nov 18, 2009) that although they have had many inquiries, they were looking for a non profit that would return something to the downtown area while allowing the property to stay in the family's hands. I doubt you will ever see the plant itself change hands, at least while the current generation is still around. I think they view themselves as caretakers of Mr. Jones' legacy, taking it very seriously, and deservedly so. Also, unlike subsequent generations of many successful families, the children and grandchildren of Fred Jones have done a remarkable job of maintaining and adding to what he built. I don't see any circumstances where that family would feel compelled to sell the building out of need. Based on this and the fact that I know they love serving the community, I understand the desire to have the structure become home to a non-profit of some sort. That said, I really do personally think the highest and best use of the building would be as some of the most outstanding urban housing in this part of the country. What nonprofit would be large enough to need a huge building like that? How about creating a non-profit that would convert the structure to housing then rent at reduced rate to anyone who pledges to do a certain amount of work for the community? Kind of a community action/involvement incubator that focuses on several areas of need, such as beautification, mentoring/tutoring kids in inner city schools, etc. That's a fantastic idea, Pete. Chesapeake did something like that with the Chesapeake Community Plaza just off Britton near Broadway Extension. Maybe Devon, Continental or OG&E would be willing to step up and do the same thing here. Tech - You're close. It's on the south side of Wilshire Boulevard between Western & Broadway. And that's a good comparison. That Chesapeake development though actually houses various non-profit organizations at reduced rent. I'm suggesting this building be converted to housing and reduced rent offered to those who volunteer a minimum amount of time towards approved community causes. There are plenty of non-profits in that area who would benefit from housing that would supply them with volunteers. We have criteria that have to be passed — it has to be a nonprofit institution that would help downtown, and at the same time allow the building to stay in the hands of the family. I may get in contact with him and see if we can brainstorm some ideas. Such a fantastic building and it's a shame to see it sit empty while the whole city is raging around it. Pete, I would encourage you to. Though I wouldn't represent to know him well, I worked for him on two separate occasions (the first for the family company for 5+ years), and never found him to be or heard of him being anything other than a really decent guy who cares as much for OKC as anyone. The same holds true for his brothers and the rest of the family. Very good people. I would expect that he would be very receptive to good ideas and would treat you with respect. I think your idea is definitely worth listening to, at the very least. As a recent graduate of OCU Law School, I find the claim of not-for-profit status to be overtly fraudulent. That's funny. I graduated in 97 and the tuition was $395/hr. I hear it is about 1000/hr now. I told them that I will think about donating about my student loans are paid off in another 15 years. The Lofts San Marco / A new lease on light. Bricktown would be nice, but with the rumors of Hotel Black turning into housing or back into a hotel, I can't help but think this might be going there. Look at their other locations and they are old historic building. My pipe dream would be for a hotel like this to be in First National, with top 8-10 floors being housing. Yes! Could very well be for Hotel Black / One North Hudson. Would fit better there with proximity to the Arts District, Myriad Gardens, etc. Also would fit their profile of going into historic buildings. Imagine the rooftop bar at that location... With an awesome art gallery on the ground level. This hotel is amazing. It would be great to have something like this in OKC and would be a much unique experience from the typical Marriott Courtyard. I hope that it ends up here. I think the Arts district would be nice, but personally I think on the canal would be amazing if it is possible to do. If they can't build it directly on the canal, then they shouldn't do Bricktown and should do the arts district. Now this would be special ! I really do think this will be in the former Hotel Black / One North Hudson building. Especially when you consider that Devon has helped Preftakes bank-roll these properties and that Larry Nichols is incredibly passionate about the Colcord Hotel; so much so he wants to commission a book about it. This would be the perfect use of this structure, especially given it's proximity to Devon, the Myriad Gardens, OKC Museum of Art, the Civic Center, etc. I'm very, very excited about this project and already envisioning cocktails on the rooftop bar, overlooking the gardens, Devon Tower, Stage Center Tower, and perhaps another tower on the site of Carpenter Square. Renovation of the Savoy in downtown Kansas City awaiting approval of TIF funding. I had never heard of 21c before, but this seems like a very slick and well run operation. They are apparently trying to expand pretty aggressively. This would be really cool for us. We already have a couple of nice boutique hotels coming (Aloft, Ambassador). More would be even better. Following the success in the bluegrass, the 21c Team is looking at opportunities to contribute to the cultural and civic life in urban centers across the country. The 17-story Hill Building in downtown Durham, North Carolina will be the 5th boutique hotel location for 21c Museum Hotels. 21c plans to rehabilitate the historic building originally designed by Shreve, Lamb, and Harmon, the firm best known for the Empire State Building. The property, which will feature a contemporary art museum and restaurant, is scheduled to open in 2015. 21c Museum Hotels plans to develop a new combination boutique hotel, contemporary art museum and restaurant in downtown Lexington pending the approval of city government and other financing incentives. The hotel will be housed in downtown Lexington’s historic Fayette National Bank Building. It will be woven into the fabric of downtown, welcoming both visitors and members of the community to experience its rotating exhibitions, participate in its cultural events and enjoy its culinary offerings. Should OKC court Bible museum?